Today I have what I hope will become an absolute staple in your kitchen, as it is in mine. 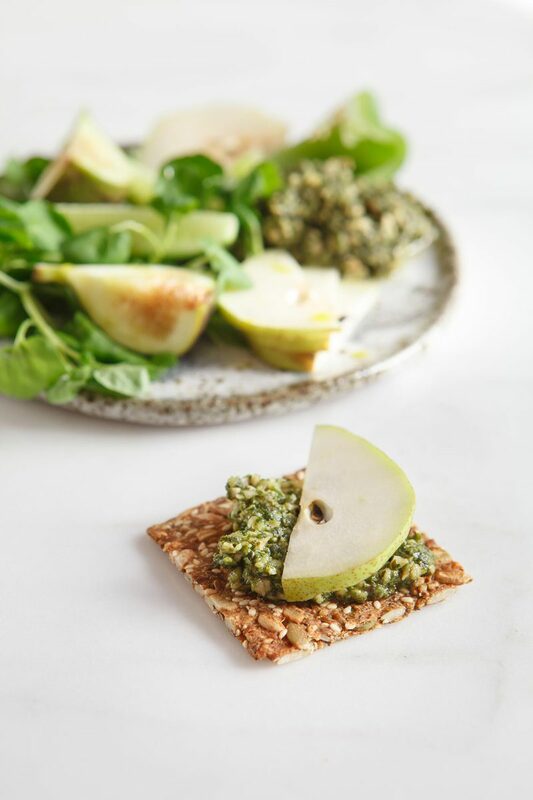 The perfect seed cracker, complete with ample crunch, best topped with all things green and wild! 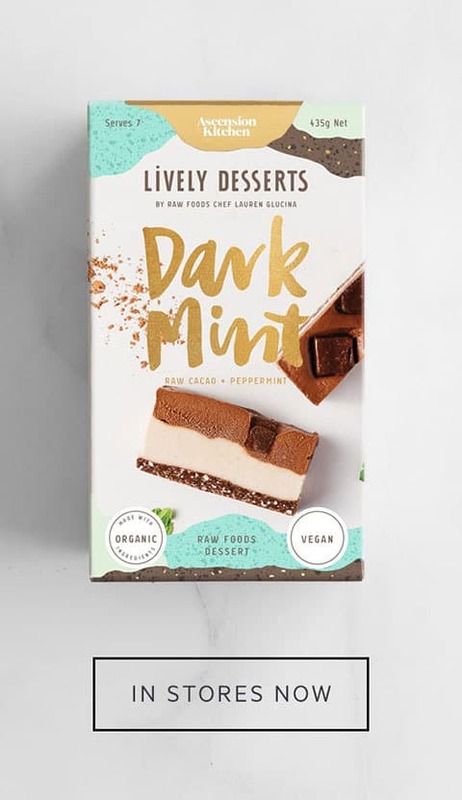 Naturally gluten free and an absolute breeze to prepare. 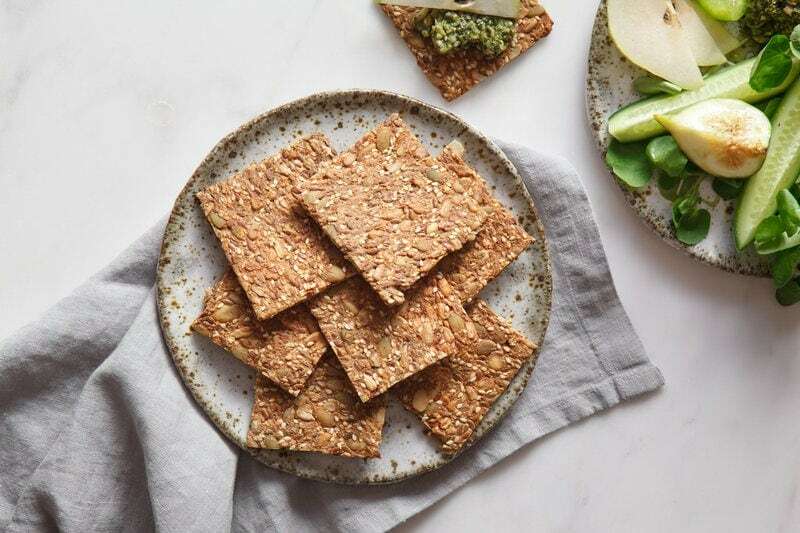 Now, if you’re an 80s babe like me, you’ll be well aware of the rice cracker fad as being the go-to snack for health-conscious peeps. Well, as it turns out, as tasty as they are, they’re far from ideal. A plain rice cracker has a glycaemic index (GI) of 91, meaning the carbohydrates are rapidly digested, providing a quick burst of energy that will fade and leave you hungry and vulnerable to overeating. 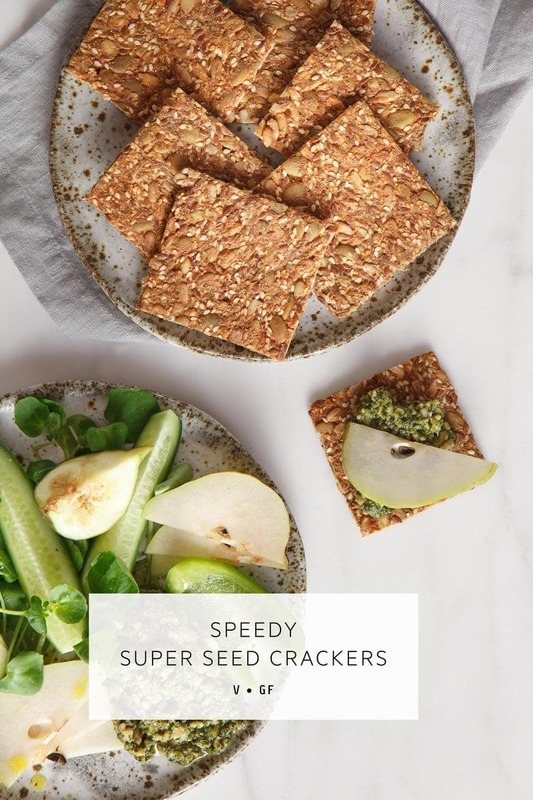 I mean – how easy is it to scoff a whole pack of crackers in one sitting?! My partner has the rare talent of devouring these in minutes! GI is a ranking of carbohydrates on a scale of 1 to 100 according to the extent to which they raise the blood sugar after eating. Foods with a high GI are digested, absorbed and metabolised rapidly and consequently cause large fluctuations in blood sugar levels. 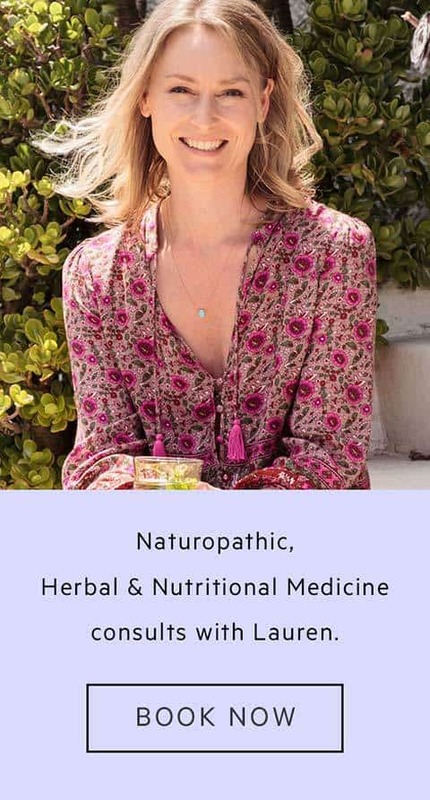 On the other hand, foods with a low GI are digested and absorbed much slower, resulting in gradual increase in blood sugar and insulin levels. Low GI foods therefore are a better choice for those with both type 1 and type 2 diabetes. Foods with a GI value of 55 or less are considered low. Unfortunately, there are also many nasties added to the seemingly harmless rice cracker: vegetable oils (these are high in the pro-inflammatory omega-6 fatty acid), refined sugar, flavour enhancers (often a whole string of E numbers, and, if it’s particularly nasty, monosodium glutamate), anti-caking agents, and salt (a lot of salt). 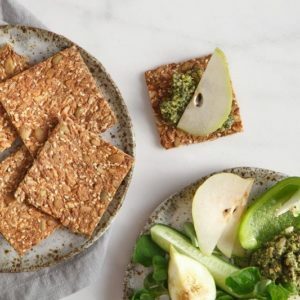 I’ve tinkered with quite a few homemade gluten free cracker recipes in the past, and settled on a carefully spiced, classic seed cracker – as they tick all the right boxes (gluten free, crunch factor, tasty, filling, nutritionally dense). What I love about this recipe though, is its ease. It can whipped up in five minutes flat, then left to its own devices for 20 minutes to swell and bind. 30-35 minutes of oven time later, and you have a week’s supply of healthy snacks done and dusted. Boom. I like my crackers to have a bit of salt in there, so I’ve used a good amount of coarse sea salt with a dash of tamari. If you need to watch your salt intake, perhaps reduce by half. I’m not worried about salt intake on a whole foods diet, it’s the processed foods that seem to be contributing the most dietary sodium. Generally when I cook for myself I season with various herbs, spices and seaweeds (dulse has my heart at the moment). Seriously. These are the ultimate! Pre-heat oven at 150˚C. Line two baking trays with baking paper. Blend buckwheat groats and chia seeds till they become a fine meal. Add all ingredients to a large mixing bowl and stir to combine. Let rest for 20 minutes, allowing the chia and flax to swell and bind the mixture. Divide the mixture in half and spread thinly over each tray, use a spatula to ensure the mixture is as smooth and thin as you can make it – you don’t want to have any gaps showing though as this will make it crumble once baked. The mixture will make two small trays worth. Bake for up to 20 minutes or until golden, then remove from oven, score the cracker into shapes, then place a layer of baking paper over the top and flip. Return to oven for up to 10 more mins. Once cooked, let cool completely, snap into shapes and store in airtight container. 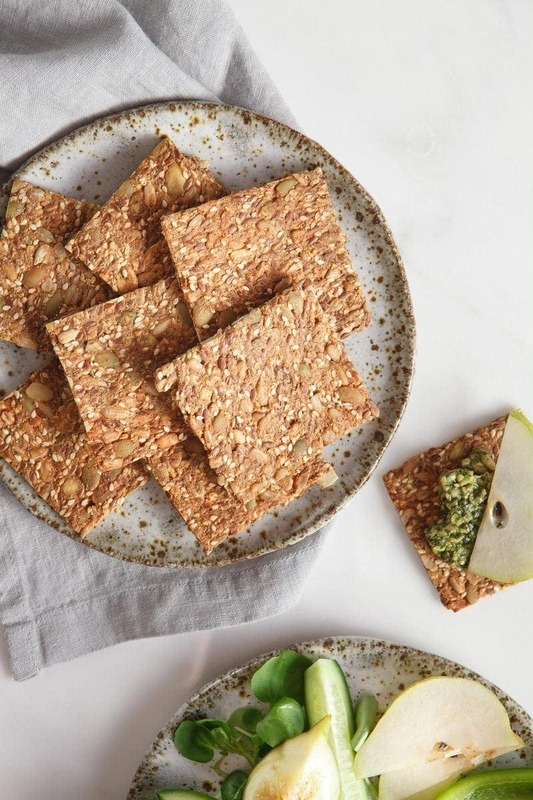 You can make these in the dehydrator if you prefer. Usually I make a point of soaking your nuts and seeds before use to reduce the phytates, however baking will reduce some of the phytic acid content. 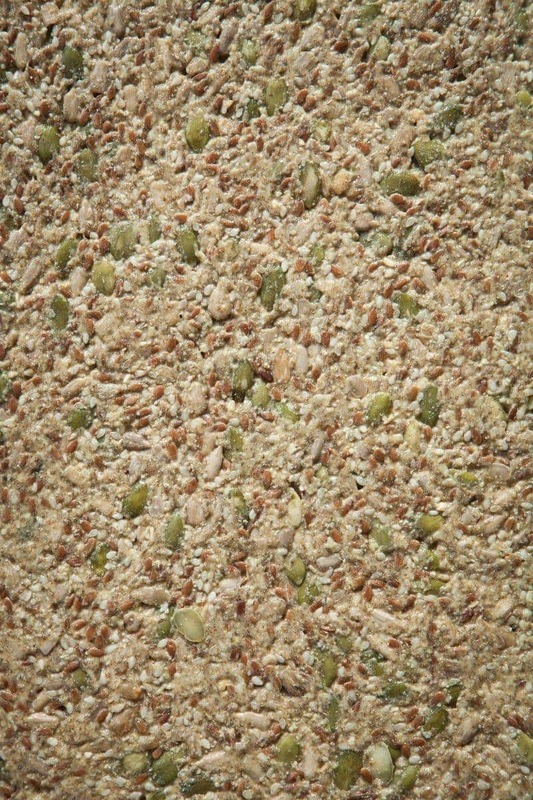 If you need to maximise the bioavailability of your minerals, I suggest using pre activated (soaked, sprouted, dehydrated) seeds. 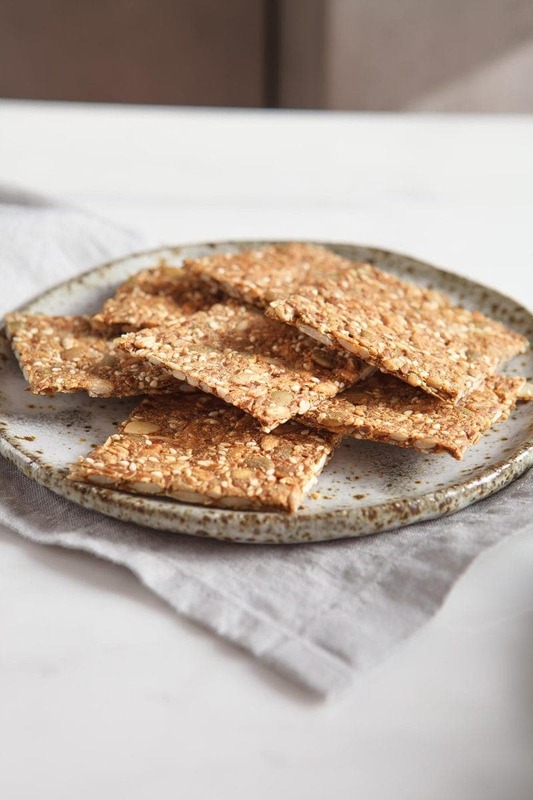 The trick to getting a crisp cracker is to spend the time spreading the mixture over the tray as thin as possible, otherwise they may be a little soft in the centre and 'bend' rather than 'snap' apart. I have made these numerous times without the tamari - and they are delicious - the tamari is quite intense so you may like to try experimenting with/without it. Use this as a base and add whatever fresh/dried herbs you want to mix it up - rosemary and black pepper is a favourite.